Beverly Smith was a beloved Toronto Disability Pride March organizer for two years before she passed away unexpectedly in November 2016. Beverly was a champion of the disability community in Toronto who spoke out strongly against poverty, as well as for better public housing and accessible transportation. In her honour we’ve set up an award we’ve called the Beverly Smith Award. 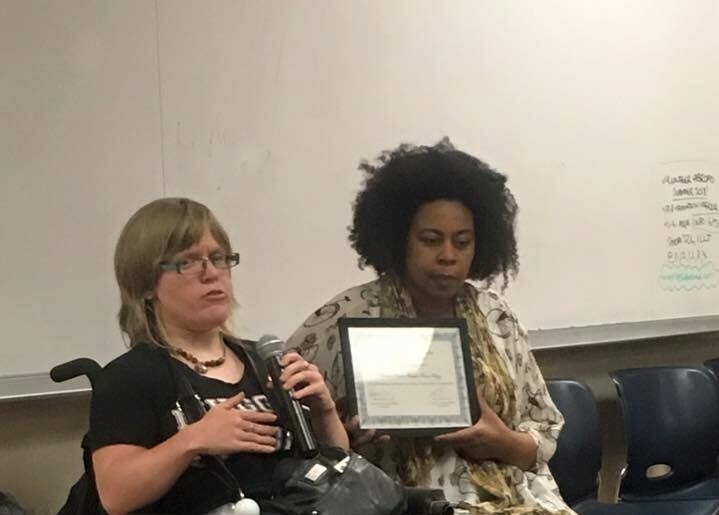 In recognition of someone who has given back to the disability community, but might not be well recognized for their efforts. We feel this represents Beverly’s gift for recognizing those most marginalized, and lifting them up, and as she kept us moving forward with TDPM. We invite you to a post-march celebration where we will present this award to it’s annual recipient, to be announced at the march. There will also be performances by a few local artist and some light refreshments. We hope you can join us in honouring Beverly. If you’d like to help us keep this award going, please email torontodisabilitypride@gmail.com or make a contribution through Paypal. Thank you!